Shannon, count us in, and if you’re making T-shirts, put us down for three kiddie sizes and a totebag for me to cart along on our travels and learning adventures. Decoration Day: "with the choicest flowers of spring-time"
We are organized, comrades, as our regulations tell us, for the purpose, among other things, “of preserving and strengthening those kind and fraternal feelings which have bound together the soldiers, sailors, and marines who united to suppress the late rebellion.” What can aid more to assure this result than by cherishing tenderly the memory of our heroic dead, who made their breasts a barricade between our country and its foe? Their soldier lives were the reveille of freedom to a race in chains, and their death a tattoo of rebellious tyranny in arms. We should guard their graves with sacred vigilance. All that the consecrated wealth and taste of the Nation can add to their adornment and security is but a fitting tribute to the memory of her slain defenders. Let no wanton foot tread rudely on such hallowed grounds. Let pleasant paths invite the coming and going of reverent visitors and found mourners. Let no vandalism of avarice or neglect, no ravages of time, testify to the present or to the coming generations that we have forgotten, as a people, the cost of free and undivided republic. The dishwasher broke down several days ago but was a replaced by a shiny new model when the VP of appliances around here decided that after six-and-a-half years of heroic service a repair probably wouldn’t cut it. Very kind and coincidental of Sears to be holding a clearance sale of this year’s already outdated models (none had the child-lock which is apparently de rigueur now — that’s what I get for letting my toddlers unload the pointy cutlery a few years ago). Much as I appreciate the machine and the fact that he installed it the day after bringing it home, I’m hoping Tom is not counting this toward an anniversary present when the big day rolls around next month. My truck broke down on Saturday night, spewing oil everywhere and frightening Tom into thinking that serious and hugely expensive engine repair bills were in our future. But it was only a tiny plug in an O-ring (thank goodness we’re talking about trucks and not shuttles) and should be fixed cheaply tomorrow. Until then Tom is the the official chauffeur to Swim Club, and I’ll just have to force myself to enjoy the break from my appointed rounds. Oh, when we went back to town yesterday morning — and it was so very much not in my plans to wake up bright and early on a Sunday morning and spend the time looking into the hood of an ailing truck — we ended up bringing back our friends’ two kids while the friends’ went househunting. Good news though. Not only did all the kids have fun together yesterday (and honestly, at this point I don’t even notice the addition of another two kids) but our friends have decided to postpone the househunting (scary house prices in Edmonton among other things) and think about staying here. A very very big hurray from all of us. The last heifer calved and we have nine babies, the last one last night a little bull calf (for a total of two males, seven females, and one open heifer who will, sadly, be sold) appropriately named Rainey. It’s still raining. That makes seven days and counting. Farming neighbors and friends are starting to tear their hair out and mutter weirdly, especially since Crop Insurance requires that all crops be seeded by May 31st, which would be…tomorrow. Good luck, even with pontoons on the tractor. Tom has decided we have so little land left to seed that if necessary he’ll summerfallow it. But the weather hasn’t kept the kids from roaming around outside, on bike and on foot, or from building and outfitting a “fort” under some bushes outside near the side of the road. So much for my hope that this was good stay-indoors-and-get-the-schooling-done weather. Homeschool funding paperwork due Wednesday. Wednesday is the last day of Brownies and Friday one of the girls in the troop is having a big party at her house since the troop isn’t making it to the big Revel (think Jamboree for Girl Guides) up in Cold Lake on Saturday, a schlep of about three hours by car or truck, and they’re supposed to be there at 9 a.m. No wonder all the parents said no thanks. Local production of “The Pied Piper,” modernized and musicalized and starring some friends (mother and two kids) terrific. Quickly reread Browning’s poem to the kids last week because I figured Davy wouldn’t remember much from last year. Definitely helped, even though the golf-playing, secretary-chasing mayor wasn’t in the original. Forget about Mozart for your baby getting the kids into Harvard. Just “enrich their lives.” I wonder if we will ever again learn to treat reading for children with the same simplicity. Well worth reading the comment, too. While browsing around the other day looking for an audio CD version of W.O. Mitchell’s Who Has Seen the Wind, which seems to available through interlibrary loan only in audiocassette edition, I was reminded that online CanLit specialist Northwest Passages (based in real life in Vancouver) has what is probably the largest set of Canadian literature links on the Internet, from book, author, publisher, and literary award lists to some lovely poetry sites, author websites and more. A truly public-spirited gift. Also, while Northwest Passages is an online bookseller, there are people there behind the computers, specifically people who know and read and love books. Which include Canadian fiction, nonfiction, poetry, drama, and literary criticism, with a special link on the main page for “Hockey Lit” (not to be confused with “Hockey Writing in Canada”). There are also links for “Multimedia” where you can find lots of books, including Who Has Seen the Wind, on audio cd. 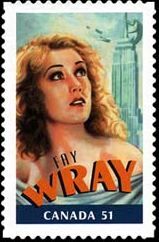 Today Cardston, Alberta, native Fay Wray was honored with her own stamp by Canada Post, as part of the “Canadians in Hollywood” series. The other stamps include Mary Pickford (who was Canada’s sweetheart first) and — I kid you not — Lorne Greene and John Candy. Heidi at 101 Cookbooks offers up a recipe for Triple Chocolate Espresso Bean Cookies, which I think I can smell through my computer. Give the kids some homemade chocolate chip cookies, and save these for the grownups.